What to know: A charming film showing the innocence of childhood and the simple joys of making new friends. Chantalle Wong, who plays Molly in this short film, is the most adorable little girl you have ever seen. True to her word, she does not play until she finishes her lunch. 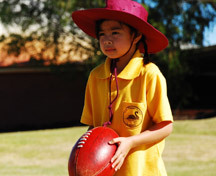 Fortunately, she meets Sam who helps her with her task and then invites her to play football. Just as mom said, eating her entire lunch makes her strong. Well produced, pleasing background music, excellent acting. A charming film showing the innocence of childhood and the simple joys of making new friends. Little Molly Lam has made a promise to her mother that she will finish her lunch before she goes to play. Her mother has packed a banquet of dumplings, fish balls, nine layer cake, fruit and so much more! Molly has a mountain of food in her way before she makes it out to play but for Molly "a promise is a promise" and she is determined to finish her lunch in time.